Ice Queen cart out at Magnusun Beach. 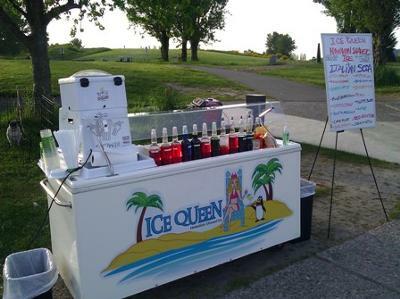 Ice Queen is a mobile vendor cart in Seattle that sells shaved ice and Italian sodas. Ice Queen does not sell snow cones! The ice shaver we use produces ice that is fine like snow and perfectly absorbs the flavor of the syrup. Ice Queen has over fifty flavors to choose from as well as five sugar-free/diabetic-safe flavors and five 100% organic flavors. The organic flavors are sweetened using sugar-alternatives like organic brown rice syrup and organic agave which are more healthy natural sweeteners that still taste delicious. We provide all the toppings to accompany your dessert: Li Hing Mui powder, sweet condensed cream, frozen yogurt and fresh fruit. Ice Queen also makes great Italian soda using coconut milk instead of cream. Ice Queen caters parties and events. Call 206-766-0045 if you would like to book a party or visit icequeenonline.com for more details. I am willing to travel up to 30 miles outside King county.